What is your favourite thing about the6ix? (I would say) the energy of the city. The city that I was born into was a very quiet, provincial town. Since the second world war, it has morphed into one of the great cities of the world. Multicultural, international in its interests, a good place in which to invest, raise a family, do business, and have fun. We’re the total package. I think anyone who warped into a time machine from the early 40’s and 50’s would say that this place is unrecognizable. In a very short period of time, we have caught up in a pulse; the dynamic pulse of the city that was missing at that time but very impalpably present today. You have a very large millennial following. Do you have any solid life advice you would like to give us? I’ve tried not to give advice. What I’m doing more than anything else is sharing my view of life in the city. Many of my interests overlap with some of the things Millennials are into as well. Certain aspects of my humour are present in the Millennial Generation cohort. I’m pleased with that experience. But I don’t want to preach – your parents must do a lot of that in your life already. Do you plan on using your influence to garner their interest and involvement in politics? I think it’s got to flow naturally. One of the things that I’ve become aware of is that I’m a politician that has shown a very personal side. I (want to) show the multifaceted personality that politicians can have and that makes them more relatable than the otherwise traditional medium where the issues are serious and the responses are as well. How can others get their Twitter terminology ‘on fleek’ like you have? The starting point for those looking to get on Twitter or already using it – if you’re not using it as a diary or as an extension of your political, social, and religious beliefs – is from the perspective of having fun. If there’s no fun involved, why are you doing it? I understand you’re on the CNE Board of Directors. Have you been to the CNE this year this year? I was down there (last week). My first walk down there is generally from a perspective from a member of the Board of Directors. My wife is with me while I engage in conversation with some of the people and get a sense of how the traffic is performing. What calorie induced food should we indulge in while we’re there? My stepson sent me a photograph of chicken on a stick with Frosted Flakes coating. My wife and I sought that out deliberately. We walked past all the others and, although it took us some time to find it, we devoured one. It’s an interesting taste between the softness of the chicken and the dough (along with) the crispness and the crunchiness of the frosted flakes. It’s the sweetness that it brings to the palette. You ought to try it! What are your plans when your terms as councilor is up? A lot of people that I’ve started out with politics have retired. I can’t imagine retirement. But if I didn’t run for office or if I were defeated, I think (I’d take up) writing. My background is in history. (I’ve noticed that) Americans have a far more developed sense of history of themselves as Americans and the American experience. So it’s not unusual for politicians to write memoirs and save all their papers for later generations to read and use as an instrument of understanding. (It’s) not just of that person but the environment in which that person has accomplished, lived, and operated. So maybe (I’d like to) pen my reflections. Is it your interest in writing that influences your good tweets? What it is exactly that goes behind your well constructed tweet? Sometimes it’s there, more spontaneous. Other times, its more reflective and (I think) about it. One of the most important things is I can say something, but I’m not sure if what you’ve said is what you’re hearing. So you sometimes you have to work on a tweet to make sure you’re conveying to the other person is what we want them to hear. And there’s a diversity out there; backgrounds, interests, attitudes. You’ve got to balance those things and hope that it’s a sharply defined and universally understood thought that you’re presenting to people. I don’t know, that’s a good question. I was once asked by a student that (at City Hall) as part of a school visit ”What do you spend most of your time on?” I hadn’t thought of that previously. When I did, my reaction was reading. The largest segment of my time is spent on reading. It could be reading the paper that crosses my desk, emails that come in from constituents, stuff that comes in from the bureaucracy here (City Hall), letting me know that that’s going to happen and this is going to happen, reading agendas, and reading books. I (also) read four newspapers every morning. So, reading takes up an enormous amount of my time. While I’m not reading in order to find material to tweet out – it helps. So when I’m reading all that stuff I might think of something, jot it down, and come back to it later in the day. The Twitter verse can provide you with all sorts of information. They analyze the data in a way I could’ve never imagined. They cut, slice and dice the information in a whole bunch of ways. I try to send out a dozen tweets a day – sometimes less, sometimes more. But it’s hard to say, how much time, really. Reading is something you spend most of your time on, but what do you like to do on your downtime? There isn’t a lot of downtime. But if there is downtime, I like gardening. I enjoy planting stuff. Seeing it grow. Tending it. Politicians who listen to rap music is not something you often hear. What sparked your interest in this genre? I listen to a broad spectrum of music. I enjoy Hip- Hop and Rap from time to time just as I enjoy Classical, Pop, and Rock music. So my interests are very eclectic. With rap, the introduction was through Drake; the person himself. He’s been very successful. He’s universally known and admired. And I think he’s part of the brand that is Toronto, (especially) in this world of competing regions. Toronto’s fighting for people, money, investments with other cities around the world. Right now, there’s a historical rush from the country side, from small towns and villages, into urban regions. We have to compete for the best people and resources, and all the things that will keep these things not only alive, but growing in a positive way. And Drake is a part of that. Like a lot of people, he didn’t leave his hometown. He brought his hometown with him. A lot of people view Toronto through him. He’s a part of that energy that I described earlier. So when Meek Mill threw a grenade at him, I was like “Hey, you’re not just attacking him, you’re attacking Toronto.” So I came to Drake’s defense and that opened up the doorway into the rap world. I (took this as an opportunity) to walk through and see what I can learn. I learned a lot of the Millennial Generation and about Rap Music and see what it brings to the city. The IT guys are on the cutting edge of technology and rappers are on the cutting edge of creativity. You need that to keep the city rolling. We’ve grown dramatically since the Second World War. You should not take things for granted. “Don’t rest on your oars,” as the famous quote goes. You always have to keep working on it. Toronto, right now, is blessed with the people out there – in many fields – that are making a major contribution to the life of the city. I’m an observer of this. And I’m enjoying it! If I can, in any way contribute to that energy and to them in creating it, I would be very pleased with my life. Who introduced you to Drake? I’ve never met him. When I became, in essence, the De Facto Mayor of the city, in the last year of the Ford Administration, I became involved in a lot of issues and I met a lot of people. This included The Raptors. I helped to get their training facility at Exhibition Place and I became familiar with the executive of the basketball team. I met with some of the players as well. And Drake also did that. He essentially became the public face of The Raptors. So, I began to, because I like humour, use him in a number of my responses in situations as they developed. I know him I guess, as people know me – from a distance. But I trust that what I know is accurate. What’s your favourite Drake album? When can we expect a Drake and Councillor Kelly selfie? I don’t know; my office has talked with his office. There could be something in the near future. Couldn’t say anything more than that. For all the skeptics out there, can you tell them once and for all, if you write your own tweets? I do. But my approach isn’t me sitting in a room all by myself and using Twitter as a personal diary. “Here I am talking with so and so and afterwards I’m going to go to lunch.” There’s a big city out there with lots of things going on. So I’ve approached it in a certain way. I use a lot of visuals and photos. And I get help in going through that and photoshopping it. That’s not something I can do. I keep my eyes and ears open. I listen to what they say and how they say it. If I don’t know that much about a topic, I go and ask people about it. How has Mayor John Tory, your colleagues, and family reacted to your fame? A lot of this has developed in August. And August is downtime in City Hall. Mayor Tory, as he should be, is engaged with the city. He’s out of City Hall more than he is in it. So most of the Members of Council are somewhere else. I rarely see them. My grandchildren and great great neices and nephews, on the other hand, are all ”If you see Drake, can I come?” The older members of the family are sort of ho-hum about it. What is your goal for your next Twitter milestone? I don’t have goals. I didn’t set out to attract a large following. That wasn’t the purpose of tweeting. The purpose was to have fun and to say to people ”this is my perspective on life in the city.” I deliberately try to focus on the city itself. I think there is a statistic that says that the majority of the people living in Toronto are born elsewhere. And so, I’m at a unique position to show people what the city looked like, 30 years ago, 50 years ago. I (like to) use archived photos of the city and get them out there. A lot of people go ”holy smokes, have we ever changed? !” I want to give them a chance to see how quickly and dramatically we’ve changed. This is Toronto in all of its multifaceted glory. We’re blessed to live in one of the great countries and best cities in the world. If I can show my enthusiasm in this city, I’m delighted to that. Follow Councillor Kelly on Twitter! Oh, what we would give for a little Friends reunion. Just to see the gang sip coffee and listen to Pheobe Buffet sing Smelly Cat over and over and over again at Central Perk. 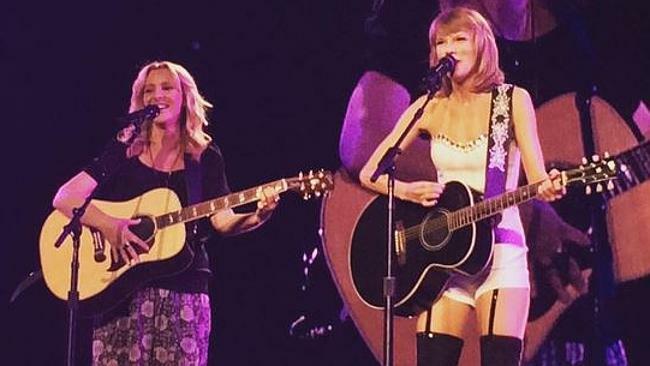 Half of our dreams came true yesterday when pop sensation, Taylor Swift, called Lisa Kudrow on stage during her 1989 tour in LA. That’s Lisa Kudrow, who played everyone’s favourite hippie – Pheobe Buffet. As the tune blasted through the microphone into our nostalgic hearts, fans couldn’t help but forget about the other 5 friends, just for that one second. It’s not your fault, folks. We cried a little too. Such feels. Swoon.